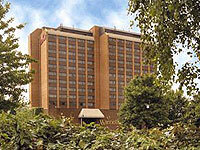 The Marriott is located towards the back of Cardiff city centre within the Cafe Quarter on Mill Lane. During the summer months Mill Lane becomes a vibrant area with hundreds of people eating and drinking outside the various bars and eateries. The Marriott has 178 guest rooms and 2 suites all of which are luxuriously comfortable. There is both a hotel cafe-bar and restaurant. There is also a full leisure club for the health conscious traveller. The Marriott is located alongside the new St Davids 2 shopping centre, so it makes an ideal base for shopping trips to Cardiff. City centre location, close to the Cardiff CIA and shopping centres. 5 minute walk from Cardiff Central Train/Bus station. Heated indoor pool and fully equipped fitness club. Event facilities for up to 400 guests. Fine dining in the Brasserie Centrale and cocktails in Chats Cafe Bar. Internet access throughout entire hotel. On site car parking (charges apply).